These 3D Zip-Change sign letter kits feature the Halftone ZipChange 3-D style (or Pronto AD style ) and can be combined with other high quality changeable 3-Dimensional looking readerboard letters ( like our Gemini Pronto sign letter ) for use with a variety of reader-board systems. 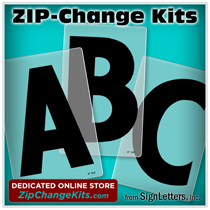 We provide these 3-D Zip Change sign letter kits as a service to our customers who need replacement letters for their existing signage system. We highly recommend Gemini products for your sign letter replacement needs. The Zip Change halftone style letter kit selections found below are for this style only, other styles are listed on the Zip-Change page. Our Zip sign letters are extremely rigid and durable and they will provide many years of service without turning yellow or warping out of shape! These Wagner letters have clear acrylic backgrounds with clear coating to help prevent scratching.